Mosaics have long been seen as the staple of Roman art, culture, and achievement and have been found in Roman buildings across the empire ranging from Britain to Africa and Spain to Judaea. Their occurrence in the ancient world is huge but how were mosaics invented? 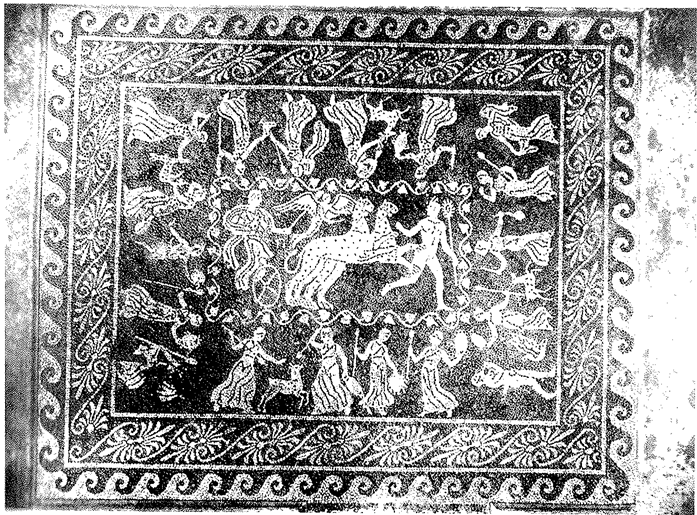 Despite being typically seen as a very Roman art mosaics have a much deeper history than is often thought, instead of originating in ancient Italy the first floors describable as mosaics are believed to be from ancient Samaria as early as the 4th millennium BC , however this development is rather detached from the rest of mosaic history. The technique later arose around the ancient Mediterranean and is normally believed to be a Greek development which was in turn passed by them to the Romans. From the 8th century BC pebble mosaics appear in Gordium in Asia Minor  and throughout the 7th and 6th centuries they are evident in the temples of the Greek mainland. 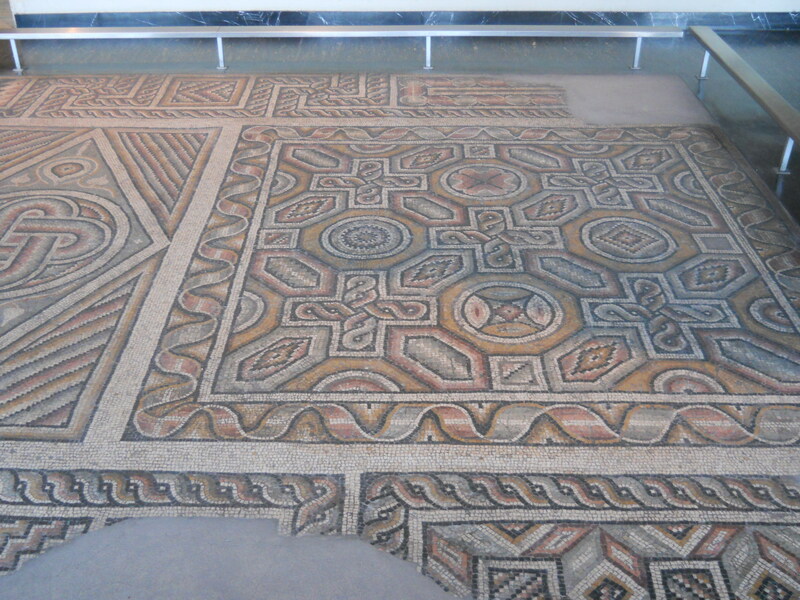 These mosaics were constructed from pebbles that were set into the foundations of ancient houses and likely developed from the need to have durable flooring; over time experimentation with colour and the desire for customization would have led to patterns being built into the floors and thus mosaic art would have been born. These pebbles were collected from local rivers and seas and were set in the foundations in their natural form not having been cut into any tessellated form. 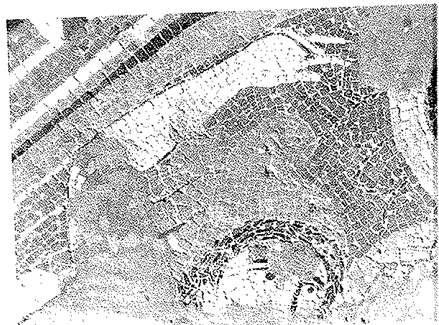 By the 4th century BC the Greek mosaics had developed into a traditional art form of significant standards and pictorial floors such as those at Pella and Olynthus (fig 1) were being created, and it is arguably from the creation of these pictorial mosaics that the need for cut tesserae emerged so as to enable a higher standard of figure representation. Over the next two centuries specifically cut pebbles and tesserae start to appear in mosaics across the ancient world as mosaics evolved in a very patchwork way and combined both techniques. The ‘house of Ganymede’ in Morgantina Sicily demonstrates this development with its namesake mosaic being made in square specially cut tesserae rather than round pebbles of earlier years. (fig 2). The mosaics there were believed to have been built around 260 – 211 BC, one of the mosaics is completely tessellated whereas the others are irregular mixing some specifically cut stones with those left un-manipulated for artistic effect. Thus we can see that the tessellated style of mosaics had developed and reached a significant level of acceptance in the third century BC as they were being built alongside other styles of mosaic: it would only be a short matter of time before their popularity superseded that of other mosaics. So having developed in the Greek east and Asia minor, when did they emerge within the Roman Empire? According to Pliny mosaics had come into common use in Italy before the Cimbric war of the late 2nd century BC. As he says it happened before the war one could likely assume the mid 2nd century BC as the date for their introduction into mainstream Roman culture and the date would make it likely he was referring to tessellated mosaics, a style which became a great mascot of Roman culture.